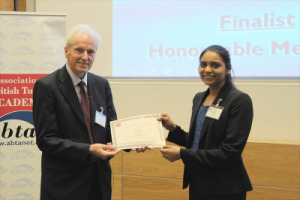 Recently, Electronics and Computer Science (ECS) PhD student Isha Gupta received the third prize for Engineering Sciences at the 2017 Association of British Turkish Academics (ABTA) Doctoral Awards. Isha, an Entrepreneurial Lead in a revolutionary nanotechnology research covering Extracellular Neural Signal Compression with Nanoscale Memristors, was bestowed the accolade at an award ceremony at University College London on May 20, 2017. The ABTA, a non-profit organization for scholars in the U.K and Turkey devoted to developing academic partnerships and bridges between two countries, has congratulated finalists on the “exceptional” quality of applications this year after considering more than 180 entries from 45 leading Universities. These Doctoral Awards have provided a great opportunity for our Nanoelectronics and Nanotechnology research group to present our work to a wider audience. We are excited and proud that the technology we are developing in our labs reached the final, and I really appreciate that we have been recognised in this way. I have learned a great deal of new things by working in a team of world class experts. People in the University, Department and the group have been extremely supportive and helpful throughout my time here. Isha’s research within Southampton’s Department of Electronics and Computer Science is designing novel bio-inspired nano-sensors using memristors. The project, referred as ‘NeuroLink’, is progressing under the guidance of Senior Advisor Professor Themis Prodromakis, an Engineering and Physical Sciences Research Council (EPSRC) Fellow and Reader in Nanoelectronics at the University. NeuroLink is making use of expertise from the SETsquared business acceleration partnership and the University’s Future Worlds incubator as it seeks to commercialize memristor-based neural data compression technologies while addressing restrictions in power, bandwidth and computation capacity. Such technologies could make an impact in applications such as brain-computer interfaces and implants that use electrical signals to cure medical conditions.